Seeking accommodation that suits your needs in Malta this year? Look no further than the Preluna Hotel and Spa in Sliema. This lively and fun hotel is ideal for everyone with lots of attractions in and around the resort. Enjoy the delights of the Sea View room that has been modernised for the 21st century. Feel comfortable in pleasant surroundings with twin beds, air con, LCD TV and coffee making facilities. If you’re looking for that little bit of extra luxury the Preluna Offers the Superior Sea View Room with added terrace and uninhibited views of the Mediterranean ocean. Have the full holiday experience at the pool side while enjoying a beer from the Piazza lobby bar that also serves snacks up until 16.00 daily. The Beach club is also a great hang out during the summer months as it serves a variety of soft or alcoholic drinks. Enjoy a buffet style breakfast in the Triton restaurant which also caters for lunch and dinner. If your group want to dine differently, try the Sakura restaurant that serves the best Japanese cuisine in Malta. Try sushi and other eastern delights during lunch time or later for an evening meal. The Mareluna Restaurant is a great stop for a quick Italian meal. Guests can choose from typical pasta and fish dishes for an authentic Italian dining experience. 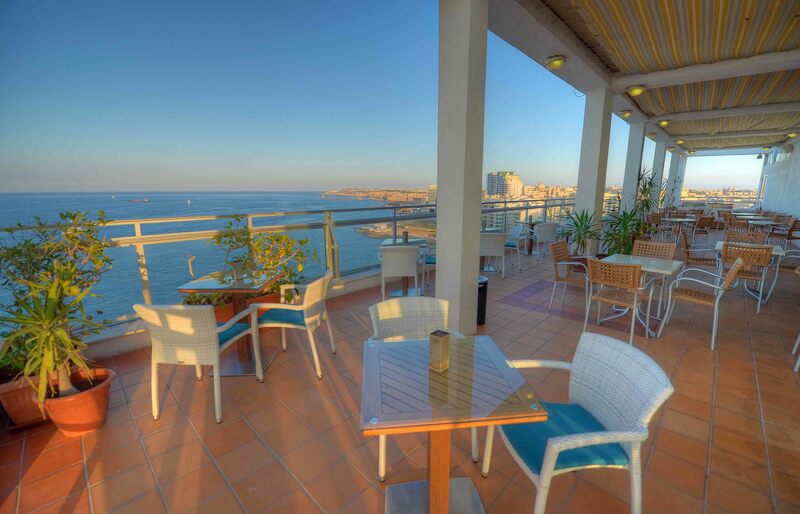 Get yourself ready for a night out in the cool hang out of the Skyroom Penthouse that serves a variety of drinks till late while you can chill looking out at the seafront from the panoramic views on offer. Sliema has an abundance of lively bars around town. Check out where to go by clicking here. Located right next to the famous area “The Strand” where you can enjoy meeting locals in the bars or try coffee in the cafes dotted around the area. There’s great transport links to other parts of the island including Valetta, the World Heritage site which can be accessed via boat service at The Strand. The lively area of St Julian’s is near with access via the seafront promenade situated across from the Preluna. Wi-Fi is available in all rooms and in the lobby so you can keep in touch with family and friends back home via your social channels. Feel free to upgrade to the hotels faster Wi-Fi service for a small daily fee.